It’s become tradition for Greg, Sam and me to wear a matching set of Christmas outfits, just for fun. Last year we pulled together a family loungewear capsule and a festive set of crazy stripes. This year, it’s a mismatched set of plaid. By the way, you know you’ve lived in the US for a while when you use the word “plaid” to describe checked and tartan patterns. Plaid was a very odd word to me at first, but now I’ve succumbed and I’m using it too. Sam was the catalyst for our plaid-cubed effect. He does NOT like to wear clothes at all. But he enjoys his collars and bandanas, so that’s where I started with this year’s Christmas outfits. I found a darling plaid scarf that was more playful than a regular plaid. I had to have it altered to fit because the XS was big for our slight 6-pounder. Together with his holiday polka dot collar, Sam’s pattern-mixed look is on-trend, bold and very comfortable. The comfort factor is extremely important when you’re playing with toys, chewing bones, eating foodies, out for a walk, snuggling, and standing guard for the Cox Castle. Sam’s stylist got that part right this time, so he shan’t be firing her. Sam was sorted. Next up, tops for Mum and Dad to match his Lordship. Plaids that are “mismatched, but work together” are very 2017. Maximally fab, on-trend, and a pattern that we enjoy wearing. I headed to J.Crew because I like their plaid shirts. I found mine right away after spotting the Perfect Shirt in Stewart Plaid. It’s a classic, somewhat equestrian, and dressy because it isn’t flannel. I then matched Sam’s bandana and my plaid shirt to a plaid shirt that Greg would like. The Blue and Green Plaid Shirt wasn’t as dark as Greg would have preferred, but he liked it anyway. Plaid shirts sorted. On to bottoms. 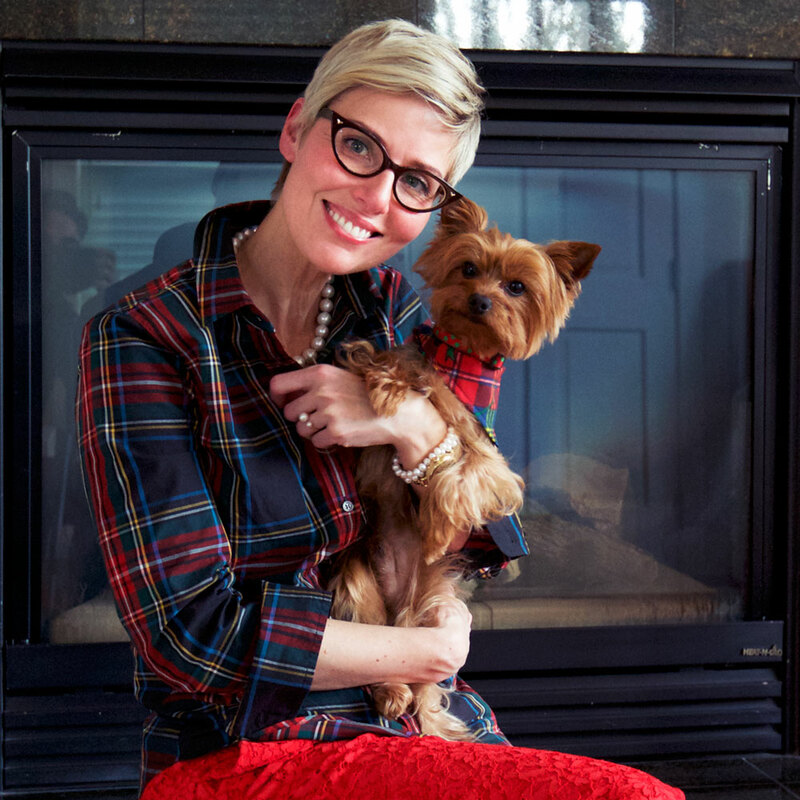 I desperately wanted to get the red tartan pants that J.Crew styled with my plaid shirt, but they were sold out. I love the plaid shirt with white jeans, and a burgundy belt and booties. But the combination didn’t feel sufficiently dressy for Christmas. As soon as I tried on the red lace pants, that was that. Not quite red tartan, but just as fab and maybe even more my style. I adore lace, and these fit like a dream. Very comfortable, flattering, pretty, crease-resistant, and a perfect length at two inches above the ankle bone. They’re shorter on me than on the model, if you can believe it. A semi-tuck of the shirt, gold heeled party loafers, loads of pearls, a cherry clutch and brown specs – and Bob’s your uncle. Smart casual, and ready for cooking and hosting. 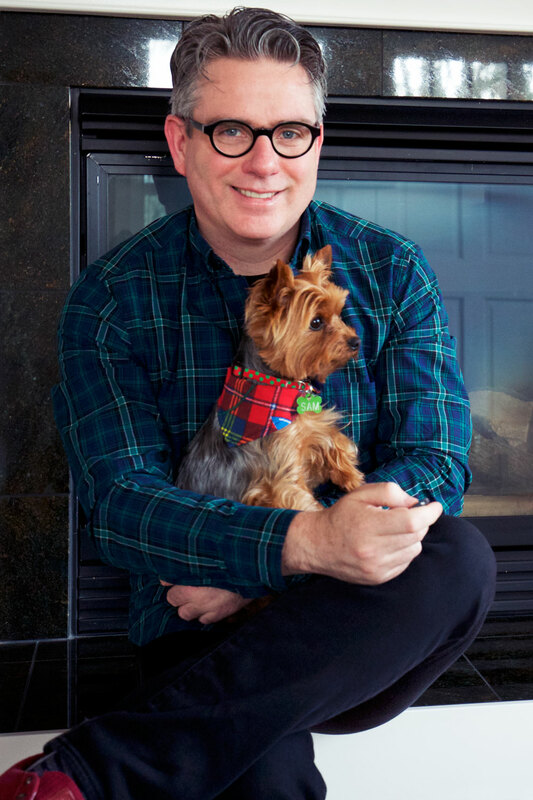 Greg matched his untucked plaid shirt with a black under tee, blue jeans, a pair of signature red sneakers, and black specs. He’s always more casually dressed than I am, and likes it that way. Greg says that if I’m dressy, it effectively dresses up his casual look when we’re out and about as a couple. Cheeky, but it works! Our little family of three will be wearing these matching mismatched plaid outfits on Christmas day. We’ll also be slowing things down between Christmas and new year. We at YLF wish you happy holidays, safe travels, and lots of laughter with loved ones. Adorable family! Best wishes to you all this holiday season, and a happy, healthy 2018! Great pictures! Have a wonderful holiday! How wonderful that you and Sam have found a compromise position when it comes to holiday dressing! And you and Greg look smashing in your mismatched plaid (and lace). Happy holidays to you all! Y’all are so cute together! (I can tell I’ve lived in Florida a while when I start saying “y’all). Nice to hear that someone in your family (Sam) shares our family’s perspective on clothes. Enjoy the holidays, and have a good start in the new year! Your plaids put a big smile on my face. Have a wonderful holiday week! Oh my goodness these pictures! How can one not have a huge smile on when looking at them. The coordinated outfits are so much fun. And Sam’s cheeky sideways glance in the top picture is absolutely precious! So heartwarming and festive. Merry Christmas to you all. Very cute in your matching plaids! Merry Christmas to you! Enjoy your time with family and friends. You all look cheery and bright this holiday season. Hugs to you! This is so lovely, it brought tears to my eyes. Can’t believe I’m getting all emotional over some cheery plaids! It’s just so much fun and your warmth and kindness come shining through in spades. Have a great holiday break! Oh how adorable you all are! I love plaid too. My doggie is too large for most wear, but he’s got a nice holiday bandana too (not nearly as spiffy as Sam’s though). Enjoy your holidays – you all look fab! Charmed by your holiday cheer times three, Angie. Wishing you a Merry Christmas and peace in 2018. Awww. Warms my heart. So festive and sweet and fun. Have a wonderful holiday season, Angie, Greg and Sam! I adore Sam! You and Greg are cool too, but Sam has my heart. You three are an adorable family. I wish you much joy for Christmas and the new year. Oh my goodness, could Sam be any cuter posed for the camera? What a lovely little family. Wishing you the best in the holiday season and a happy new year. Naz! The mismatched plaids are genious, I love how both your and Greg’s style aesthetic still shine through, and the plaids feel festively fun to me. Your lace trousers are genius here too. Wishing the three of you and everyone here on YLF wonderful holidays! Thanks for the wonderful wishes and kind compliments. It’s fun matching as a family at Christmas time – if I keep his Lordship happy, that is. YES. Sam’s face in that first picture cracks me up. He’d had enough…. Oh, Chris. You are lovely. Big hug back. Jjsloane, Sam is high pawing your plaid wearing doggie. Zibbets, what a lovely thing to say. I’m touched. Inge, if you were here, you’d be wearing mismatched plaid with us! I love your plaids. My boys, Mr Skunky and Bob Barker (not their real names), wore plaid collars for awhile. Mr Skunky wore red plaid, and Bob wore green plaid. I always laugh when I see a picture of a Scottie in a jacket. Mr Skunky is never cold. Bob is very scrawny and is cold all the time. You all are too cute! Happy holidays! Wonderful, Angie. You, Cheeky Greg and Sam all look fantastic. Happy Holidays to you all! I picked up the JC Stewart Plaid shirt as well for Christmas. Not sure if I will go maximal with my Black Watch pants or just do a black pant. I don’t have any colourful bottoms. My fur baby Lou will be wearing a tartan bow tie that attaches to his collar. Like Sam, he doesn’t like playing dress up but will happily wear a bow tie or bandana. For New Years Eve he will be sporting a purple with black polka dots bow tie. Angie……I adore your wire tree. It looks amazing decorated with your treasured ornaments. Where would one find such a thing? What a festive family! Happy holidays!!! Completely love all these pics & the mismatched outfits (everyone looks wonderful), but the pic of you and Sam just slays me! He is a doll. Love! Merry Christmas and a Happy New Year to you and yours! Oh my goodness, little Sam’s face…. so much squee. Adorable. And, you and Greg look festive and stylish, of course! GORGEOUS photos of the whole family! It’s such a treat to see you all together here! Love this. Angie, you look amazing in that shirt and the lace pants. What a perfect at home holiday look. And Greg looks very handsome in his shirt, which brings out the colour of his eyes. As for Sam, I am speechless with admiration for this little canine emperor!! He rules the Cox castle with aplomb. I love Sams little side glance in the first photo- he is so adorable. All three of you look wonderfully festive! Have a very Happy Holdiay. Have a blessed and beautiful holiday season, Angie, Greg and Sam! Thanks for sharing your sartorial splendor with us! Very fun! I got my boys very similar plaid shirts to Greg’s. Very similar colors. It worked well in our Christmas photos. All my children will receive stripy cute jammies (burgundy with penguins) on Christmas Eve. Merry Christmas to Sam, Greg and Angie! Merry Christmas to the fabulous Cox family. Plaid becomes you all! And Happy Holidays to the entire YLF Family, May the new year bring health and happiness to all. Sending my best wishes for a happy holiday season to all the inhabitants of the Cox Castle! Spending time with family friends is the best, and, when you do with such style, it’s a delight for everyone who sees you! I saw Sam’s face in the first photo and went squeee! It should be illegal how cute he is. 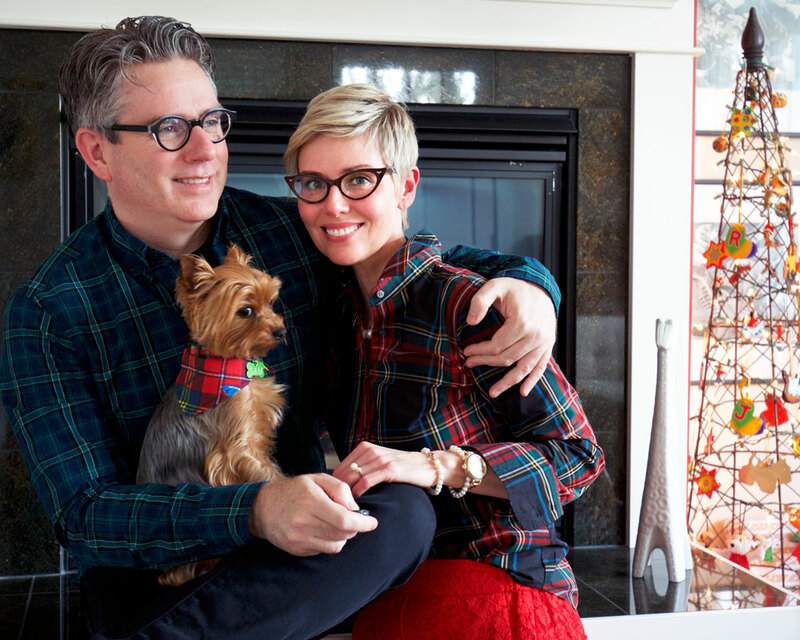 I lovevoe the mismatched plaids, and wishing the Cox family very merry holidays! I can’t tell you how happy this post made me. The pictures made my day. Love!! Holiday colors without being obviously thematic. Love how happy your family look in these photos. What a lovely family! I ordered that JCrew shirt when you highlighted it a week or so ago. I love that they do petite sizing, it allows you to find the perfect fit! Adorable! I love it all. Merry Christmas to you and yours. OH, how I love the side-eye Sam is giving in the first picture! Too cute! Love coordinated family picties, this one is no exception and perfect in every way but wow, that side eye of Sam’s is K2K! Happy Xmass everyone! Oh, yay! Family outfit pics! You all are adorable in your Christmas plaids. Love your shirt with the red lace trousers, Angie. Merry Christmas to you! You all are sweet together I think I was eyeing that shirt since last year. I am glad that you got it and found the appropriate items to fill out the family Christmas capsule. Sam is the most photogenic little doggy. Wishing you all a very Merry Christmas in your mismatched tartan (I haven’t adjusted yet LOL). You all look so smart and gorgeous. I hope the festive season is relaxing, delicious, joyous and peaceful filled with love and laughter. You are a photographic lot!! Oh, these photos are wonderful! Merry Christmas to you and your family! Such a gorgeous family. Merry Christmas! Wonderful photos! Merry Christmas to you and your family Angie. I hope you enjoy the break. Thank you ALL for the wonderful wishes and kind words. You’ve definitely added a layer of fabness to Christmas. Marilyn, high five shirt twin. I bet you’ll look fab no matter what you match it with. Your fur baby sounds very stylish, and Sam is high pawing him. (It's a special tree. Metal and modern, yet awfully classic. It wasn't for sale. A florist had it made for a shop display, and I asked her to sell it to me 14 years ago. I was very persistent – she couldn't refuse). Jlpp, from one doggie lover to another, Sam steals the show – as he should. Suz, your gracious words are a gift. (And dead right. Sam rules our Castle). Columbine, your family Xmas photo sounds fab. kkards, Sterling, Sal and Gaylene, you are lovely. Hugs. Tanya and Lyn67, Sam wins best side eye. Yay, Brenda. Enjoy your new shirt. Scarlet, Sam thanks you for the compliment. Rachy, HAH. Lilypup will take Sam shopping. Very Merry with your plaids! Warmest wishes for all things bright and beautiful. Then the look on Sam’s face in the family photo is so funny!! You look so, so pretty. Love all the plaid. For a split second, I thought you might be letting Greg wear sweat pants with his plaid, but I realized they’re his jeans. 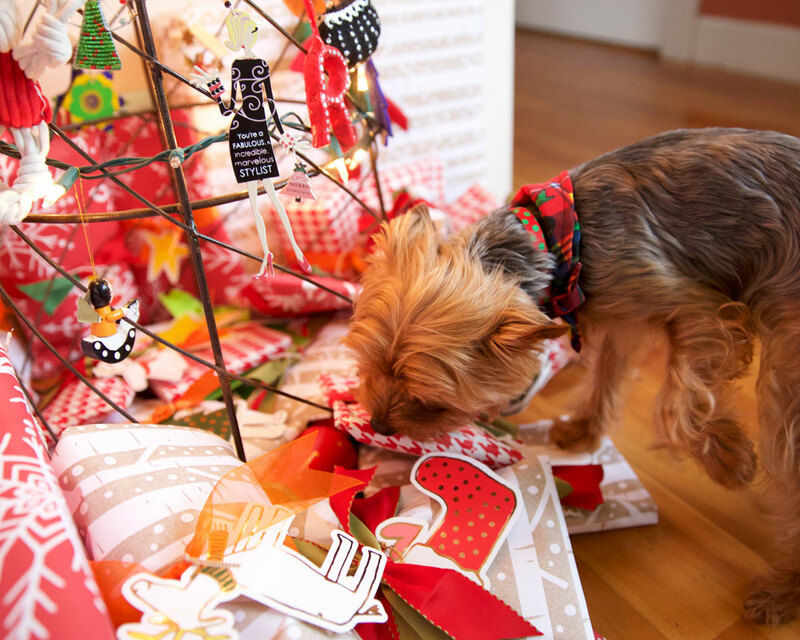 And lastly…so cute to see Sam checking out the presents. Pups are such little snoops! May your holiday be everything you, Greg and Sam desire! What a handsome family! Happy Holidays! You all look as sweet as holiday treats! Hope it’s a blessed Christmas and a wonder-filled new year! All the best to you! Oh my gosh…so perfect in every way! Happy Holidays! What wonderful pictures! A very Merry Christmas to you, Angie, and your family! You’re all so nice. Thank you. Happy long Xmas weekend to all of you. Oh, Dana. What a kind, thoughtful and gracious comment. You are fabulous. Have a wonderful holiday season Angie, Greg, and wee Sam! Merry Christmas! You all look very fab! I have SO missed seeing photos of you on the blog! These are just adorable. Happy Holidays to you and your family. Your family is absolutely beautiful! Have a Merry Christmas. Gorgeous pictures. Merry Christmas Angie, Greg and Sam. Sam is adorable! I love your mismatching outfits. Merry Christmas to the Cox Castle! Oh my word, my heart just melted into a big puddle! These pictures are adorable and fabulous in equal quantities. I’m sorry, Greg and you Angie, but Sam steals the show by miles! Merry Christmas and Happy New Year! You three look adorable. We’re almost pants twins – I have the black ones from 2 years ago. They come out to play this time every year and take me to school holiday concerts to brunches with Santa – love them! Sam looks like he is ready to rip open his presents. Such adorable expressions. Mags keeps stealing the sheep from the crèche. Maybe, being a sheepdog, she thinks she is protecting them. The whole look is warm and festive at Cox Castle. You look ready for hot cider and cookies, (or doggy treats). Have a lovely Christmas. Sam ,you look great and I love how you ve accessorised with two plaid clad humans.Have a fabulous Christmas! More warm and lovely festive wishes. Thank you. Diane, we can’t compete with his Lordship. Kerry, high five. They are a handy pair of pants to have in our closets. Joy, your comments make me smile. Mags is adorable – like you. Cardiff girl, dead right. We accessorized Sam! Angie I’m late but also wish to say Happy Christmas to you all. Gorgeous shots, Sam is so cute. 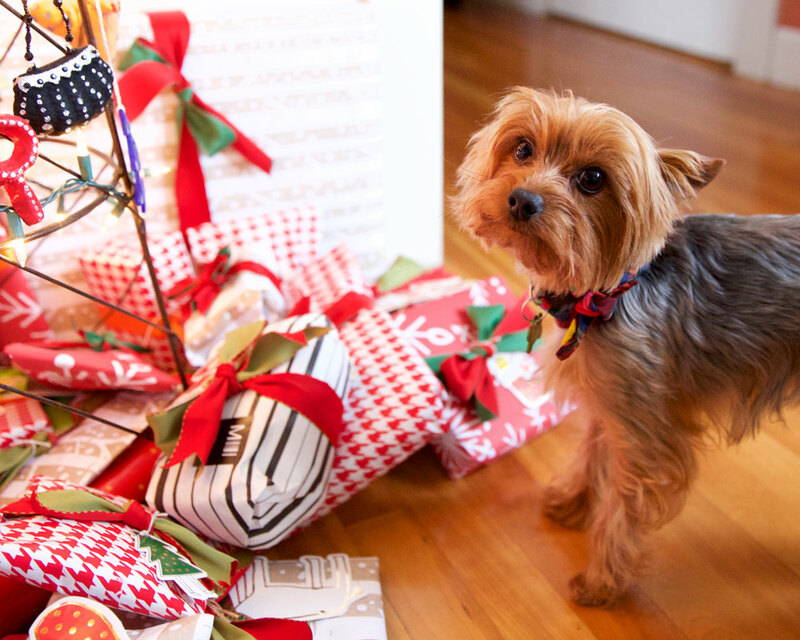 And I especially like the red houndstooth wrapping paper! Lovely pictures and wishing all the the Cox Castle a Happy Christmas! You all look wonderful in your festive tartan outfits, but cute little Sam steals the show. Thank you, ladies. Feeling festive on this lovely Christmas Eve. Snow forecast for tonight. The best mismatched plaid ever! Thank you for posting these pictures, Angie. The glimpse into your family’s quiet, comfortable and very stylish Christmas is priceless. I only wish I could see more of those lace pants, I am sure they look incredible with the plaid shirt. And of course Sam steals the show as usual. What a little star! Wishing all your family a very merry Christmas. You deserve a break but I will miss checking in with you every day. The family Christmas photos are lovely. Merry Christmas! Sveta, thank you for your awfully gracious comment. Hope to see more of you on YLF in 2018. How did I miss this? Loved all your family pictures, Sam is so cute. I totally would be, Angie!! How fun would that be!! Too cute, all of you! Happy holidays! Do you and your hubby have children? So nice. The three of you look so happy. Happy Holidays to you. Ah, what lovely family Christmas pictures! I love the matching tradition. Did Santa bring Sam something nice? I am happily your shirt twin, after your previous recommendation of it – I also planned to wear that at Christmas, but ended up wearing something that came wrapped up under the tree instead – a hoodie with a cosy fleece/fake fur lining, bliss. What a beautiful family. I am late, but wishing you a very happy holiday season. You guys rock plaid like no bodies business. Thanks for the kind wishes. Hope you're having a smashing end of year break. Secret Squirrel, Sam gets lots of presents! One of the best parts about Christmas is seeing our doggies open their prezzies. High fiving my shirt twin. Violett, we don't have children. Such beautiful photos of your family Angie, thank you for sharing. You are truly an inspiration to me. I learn so much from you in the fashion sense, but more importantly, I respect your graciousness and kindness. Warm holiday greetings from chilly Canada! Oh my word, Sabrina. How touching. Thanks for the awfully kind words, and hope you’re staying toasty warm. A belated Merry Christmas from the East Coast! We’ve got single digit temps here, but your adorable family photos are warming and oh so sweet. Here’s to a beautiful holiday week! Just saw this and I am speechless with delight and admiration at the style and love you three share for one another in these amazing photos. That sly little side look from Sam, in the first photo, is so adorable. You are all plaid precious!! !